Specially designed for electrostatic experiments and where continuous source of high voltage is required. Fitted on base with smooth running DC Motor, operates on 220 volts A.C. 50 Hz. Charge collecting Belt: Silicon rubber having excellent insulation resistance. Tracking: Belt-tracking easily adjusted. Charge collecting combs: Aluminium mesh, clearly visible. Spheres: Aluminium 150mm. dia. Connections: 4mm sockets in dome and base. 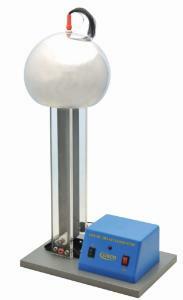 Voltage developed: Upto 200 kV, depending on ambient conditions and humidity, with a spark length of 60mm. Discharger: Spherical 100mm. dia., with insulated handle and 4mm sockets.